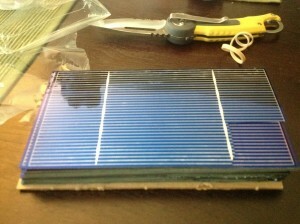 I have recently attempted to make my own solar panels. This seemed like a fun project (I love soldering) that would at the same time produce something useful. There are several various electronic devices around the house that would be nice to power on solar energy, plus a solar panel could prove handy if we lose power and need to charge our phones or computers. I decided to start by ordering some 3×6 solar cells online. I went with the untabbed versions, meaning I would need to do full assembly myself. My goal was to make two smaller panels consisting of 18 cells, then connect them together to get a 36 cell unit. This should produce 18 volts, which would charge the 12v battery I want to work with. 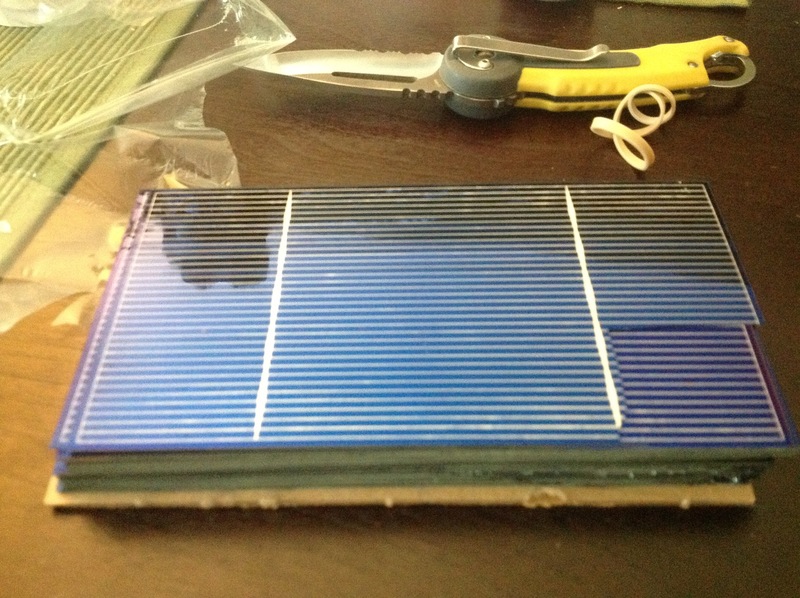 Tabbing the solar cells together was not as easy as the online videos I watched made it seem. The tabbing wire would not stick down to the panels easily, so it took time to figure out the needed level of heat, pressure, and solder to make it work. I finally got the hang of it and was able to assemble my panels. I made two smaller panels due to a workspace problem, as one large 36 cell set would not fit easily on my table and I would have a hard time maneuvering it. Independently, both of my 18 cell panels produced the expected 9 volts. However, once I connected them together with bus wire I would only get a total reading of 13 volts. I am somewhere losing 5 volts. This was disappointing because I really need to get all 18 volts possible to efficiently charge my battery. I have been working on my connections trying to figure out if I am losing volts to bad connections or what might be happening, but as of yet have not been able to identify the problem. I will have to keep working on it to see if I can figure out where the loss is occurring. Another problem I ran into is that I didn’t take the time (or put in the money) to build a sturdy enclosed case for the panels. I attached them to some cardboard pieces, with the thought that once I was sure they were working I would later worry about transferring them to a sturdier case. This ended up not being the smartest move. The cardboard I used was sturdy, but did have some flex to it. This meant that every time I moved the panels, even small flexing would result in some of the cells cracking. Most cracks were small and did not affect their functionality, however it is only a matter of time before they get too damaged and will not work as well. I recommend immediately putting the panels into a sturdy enclosed case to protect them from the beginning. Overall my project was only a partial success. I was excited that I did have working solar panels after my first attempt ever. But, I was disappointed that I was not able to get full voltage from them, and I did not enclose them well. I can learn from my mistakes though, and plan on trying again with smaller solar cells and a new configuration. I will post later how my second attempt goes. Tags: solar panelBookmark the permalink.